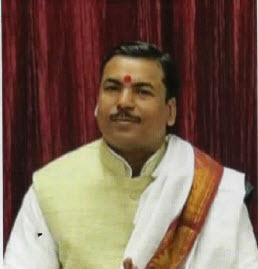 Acharya Santosh Tripathi ji is from Kashi (Varanasi). He obtained a Bachlor's degree (Shastri) in the year 2002 and Masters degree (Achraya) in 2014 from Sampurnand Sanskrit University, Kashi. In India, Tripathi ji served in various capabilities at several Temple and organization as Trustee, President, Manager, Acharya, Vyasashree, Smrakshak etc. Acharya Tripathi ji has been performing the rituals and festivals duties and has intense knowledge in teaching about Hindu religion Karmakhand, Anusthan, Sri Maha Mrutyunjaya jap, Shatha Chandi Mahayagya, Rudra Mahayagna, Sri Vishnu Mahayagna, Sri Lakshmi Narayan Mahayagna, Sri Hanumat Mahayagna etc. in various ways. Acharya Tripathi ji has expertise in performing Mundan, Upanayan, Shilanyas, Bhoomi puja, Vasstu shanti, Gruhu pravesh, Business inugration, Vehicle puja, SriSatyanaryan Vrat Katha, rudrabhishekam, Navratra Kalash Sthapan, Chandipaat, Si Lakshmi Puja etc. He is fluent in Sanskrit and Hindi, well versed in Astrology, Palmistry.Enjoy the privilege of obtaining his guidence. Temple prepares delicious vegetarian mahaprasadam for deities. The mahaprasadam offered is pure vegetarian without garlic, onions, mushrooms etc...You are welcomed to sponsor the food / mahaprasadam offered to the God. If you wish to sponsor langar please contact Temple office at 425-413-8900. 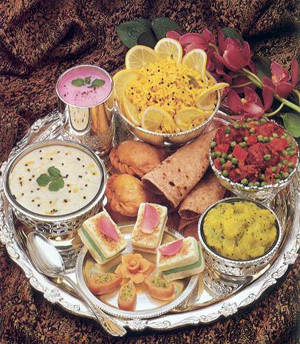 Yes, you may bring prasad prepared in clean vessels used to prepare only pure vegetarian food, and it is free from onion, garlic, mushroom, etc...It needs to be prepared with full faith and devotion towards the God. If you are planning to bring maha-prasadam for more people please contact the temple volunteers to help you schedule your maha-prasadam.